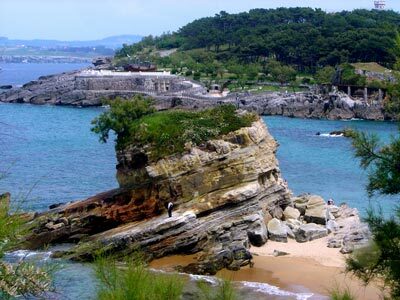 Santander is a beautiful port city in Spain. It is counted as one of the most favourite destinations of the visitors from all over the world. There are a number of places to see and a lot of activities to do here. It is a place which has something for every age group. Situated on the north coast of Spain, the city is full of museums, churches, parks, gardens, historical monuments and a lot more. Car rental solutions are highly recommended to those tourists who want to enjoy a memorable holiday in this beautiful place. There are a number of hotels and apartments in the city providing superb quality accommodation facilities to visitors. Tourists can also enjoy their evenings at the numerous pubs, cafes and nightclubs of the city. Santander is also a great place for shopaholics as there are plenty of different types of shops to choose from. The major attractions of this marvellous Spanish city include the Prehistoric and Archaeological Museum of Cantabria, the Bullfighting Museum, Paseo de Pereda y Calle Castelar, Jardines de Pereda, Avenida de la Reina Victoria and Biblioteca y Casa-Museo de Menéndez Pelayo. All of the places are easily accessible through car hire solutions. The Prehistoric and Archaeological Museum of Cantabria or Museo de Prehistoria y Arqueología de Cantabria is the main museum of the city displaying some 1000 antique items from the Palaeolithic, Iron and medieval ages. The Bullfighting Museum is known among the tourists for its bullfighting memorabilia, posters, photos and paintings although it is not to everyone’s taste. Moreover, the Cathedral de Santa Maria de la Asunción, the Iglesia de la Anunciación and the Iglesia de la Consolación are some of the beautiful churches in the city which are quite famous among tourists for their breathtaking architecture. The Town Hall, Mercado del Este and Mercado de la Esperanza are some other notable buildings of Santander. Car hire is a must to get around all of these sites in one holiday. The Paseo de Pereda y Calle Castelar is a 1550 m long street offering a scenic view of different buildings built between the 18th and 20th centuries. The Avenida de la Reina Victoria is known for its beautiful views and beaches of La Magdalena and El Sardinero. The Biblioteca y Casa-Museo de Menéndez Pelayo is a very famous library which consists of some 50,000 books and documents. A trip to this beautiful city would be wasted if you did not spend some time exploring the attractions and Santander car rental is perfect for those who want to make the most of every moment. Rentalcargroup.com compares car rental prices for Santander Airport). We work with many car rental companies so the quality of the cars is guaranteed. This way you will be sure to get a rental car that suits you the best and for a competitive price. Parking your rental car in Santander Airport can best be done in a garage. Its safer for you and your rental car. There might be the possibility to park your rental car in the outskirts of Santander Airport and move around by public transportation which is not too expensive and will compensate for the parking fee you will need to pay if parking in the city center. Take in mind that many big cities have a city center only accessible for locals or delivery purposes. Last month, the average car rental length at Santander Airport was 6 days. The average rental car length at Santander Airport is 6 days. The most booked rental car type currently at Santander Airport is ECONOMY cars. Last year, the most booked rental car type at Santander Airport were ECONOMY cars. How much does it cost to rent a car at Santander Airport? Last month, the average car rental price was 131 USD. Last year, how much did it cost to rent a car at Santander Airport? Last year, the average car rental price was 81 USD. What is the current average daily price to rent a at Santander Airport? Last month, the average rental price was 22 USD per day. How much did it cost to rent a car at Santander Airport over the past 12 months? Last Year, the average rental price was 14 USD per day. The car rental companies available at Santander Airport are: OKrent. See below last 5 customer reviews. Our customers rated Santander Car Rental with an average of 0.00 based on 0 ratings.